One of the things we as paranormal investigators needs to keep in mind is that the devices we are using for our investigations are not specifically designed for this purpose. To date, I do not know of any device that has proven to be an effective means of capturing proof of spirits though there are some great theories out there. Please keep an open mind while reading these pages, If you have any questions, comments or find anything that does not appear to be accurate, please click the contact link to the left and send me an e-mail. Portions of this site are dedicated to exploring the more technical side of paranormal investigations. If you are looking for any information on specifics devices, you may find it in the technical link to the left. 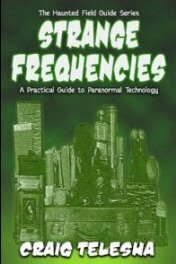 Now Available: from Craig Telesha and WhiteChapel Press - Strange Frequencies A Practicle Guide to Paranormal Technology.